You may think that’s Guacamole in the photo below, but you’d be mistaken. You see, I was in the mood for some Hummus and happen to spy a can of Hatch Green Chiles in my pantry. What? 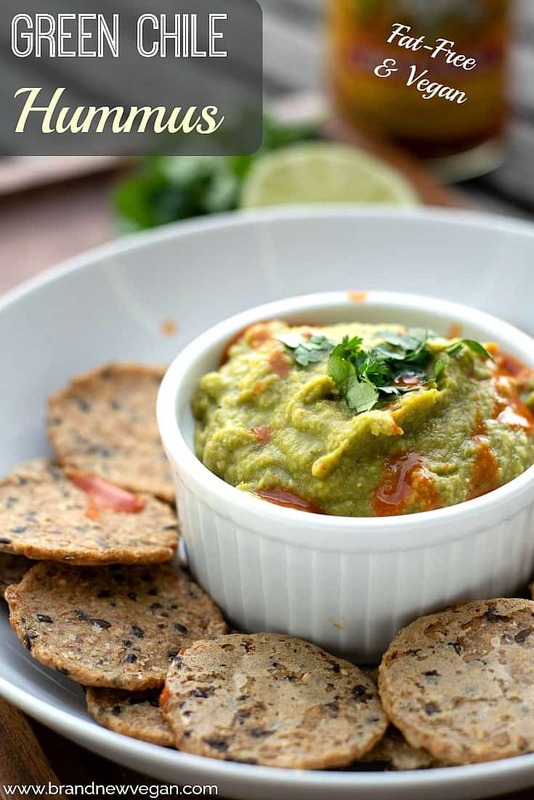 Green Chile Hummus? Could it actually work? Only one way to find out! Who says Hummus has to be just chickpeas and tahini? 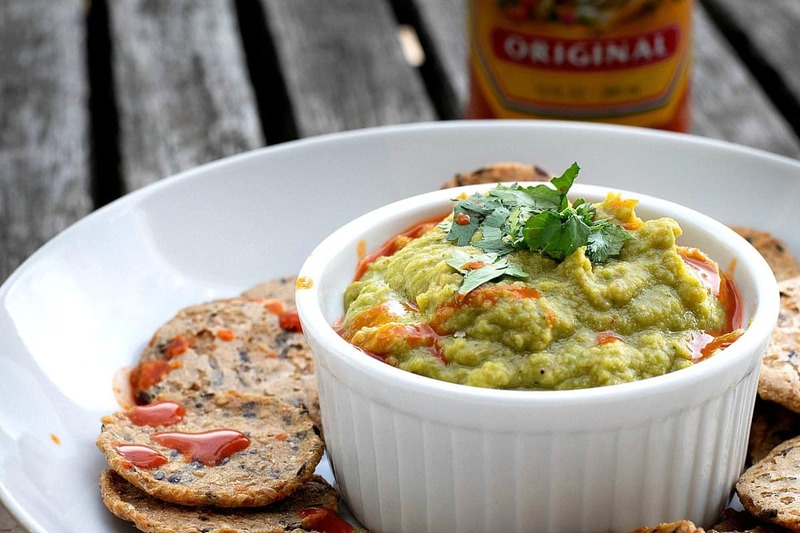 So why NOT Green Chile Hummus? Toss in a little Cilantro, some Lime, maybe a little Jalapeno for heat? Mexican Hummus? It might just work…..
Well let me tell you….not only did it WORK…..this stuff’s like my new favorite Hummus of all time! I mean DANG it’s good. No oil and no tahini means it’s virtually fat-free….so eat up! (oh – and this totally gave me a chance to try out my new Vitamix I found on sale at Costco……AMAZING!). No worries – you won’t need a Vitamix to make this Green Chile Hummus, just a regular old blender and a handful of everyday ingredients. And it never ceases to amaze me how regular old pantry staples like chickpeas and chiles can come together to make something absolutely incredible like this. I mean Chiles and Chickpeas? Who woulda thought? All right – enough blabbering. Ready to do this? Like I said, I just bought a brand new Vitamix Blender, but any blender should work just fine. Drain a 15oz can of Chickpeas and give them a good rinse, then toss them into your blender. Next, cut a lime in half and remove most of the zest, but not all of it. The lime zest (the green skin) will give this a really nice flavor, but we don’t want too much. Now toss that entire lime half into the blender. Add about ½ of loosely packed Cilantro to the mix. As Guy Fieri says, “Everybody into the pool”. Drain a 4oz can of chopped Green Chiles and toss that in too. I found a can of Hatch Green Chile at my local Safeway, but any brand of Green Chile should work. And if you happen to have some FRESHLY roasted Hatch Green Chile, adjust according to how much heat you like. Finally, add a Jalapeno (after removing the seeds and membrane), the garlic, and the remaining seasonings and give that a blend. Again, if you have freshly roasted Hatch Green Chile, you may not need a Jalapeno at all. I only added it for a little spice because canned Green Chile is usually pretty lame when it comes to heat. Blend, blend, blend and, depending on your blender, you may need to stop and scrape down the sides a few times with a rubber spatula. If needed, add a Tablespoon of water or so to help blend it all smooth. And that’s really all there is to it. Give it a taste and adjust any seasoning to your own taste. I garnished mine with a few drops of Cholula Hot Sauce and added some extra Cilantro on top. Adding some freshly chopped Green Onions would be good too. 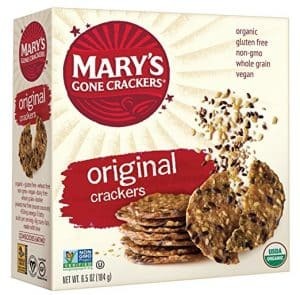 As far as the actual dipping vehicle itself – I used some oil-free crackers called “Mary’s Gone Crackers” that are pretty good. They are available at my local Grocery Store but I’ll also add a link to my Amazon Store below in case you can’t find any. Remember this will be an Affiliate Link where I make a small commission if you click on it and buy any. 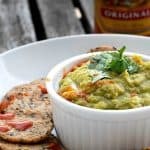 Hope you give my Green Chile Hummus a try, and if you do, please leave those comments telling me what you think. You may think that's Guacamole in the photo below, but you'd be mistaken. You see, I was in the mood for some Hummus and happen to spy a can of Hatch Green Chiles in my pantry. What? 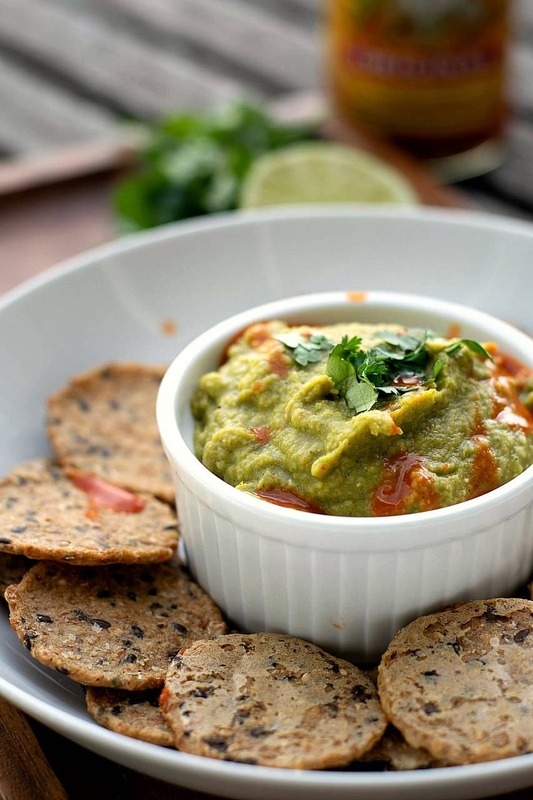 Green Chile Hummus? Could it actually work? Only one way to find out! Drain and rinse the Chickpeas and add them to your blender. Drain the Green Chiles and add them to your blender too. Remove the seeds and membrane from the Jalapeno and add that to the mix. Add everything else and blend on high until nice and smooth. Add the tablespoon of water if you need to thin it down some and help it blend. Do you add the juice of the 1/2 lime or just the zest? The entire half of lime, juice, zest, everything! I have no idea what it would taste like with Parsley…. but of course, you’re more than welcome to try it and report back! OMG! I love having your New Mexican take on food. Another awesome hit. Thank you! I have a hatch green chili powder my mom gave me from New Mexico. Could I sub that for fresh and use fresh jalapeño? I am unsure if I can get cans of hatch so far north. Thanks! Use the Jalapeno. and then maybe add a teaspoon at a time of the powder until it tastes the way you like it. They are both canned…and they are both the same style of Chile – so yes, you can use those. Would like to see a photo of that partially peeled lime. Peel the 1/2 lime but leave a small amount of the green zest intact. Maybe the size of a quarter. That’s all. Just made a batch of this hummus and it is lip smacking good. I am going to a bit of it as a sandwich spread for my grilled squash.zucchini and red onion sandwiches! Thanks Chuck! This is going to be a staple in my house.